The pursuit of love can make one a fearless fool while to deny love can make one foolishly afraid and eventually filled with sadness and regret. Loving another person involves risk. Betrayal and rejection can harden the heart, but not necessarily the spirit. For many an artistic person, the hurt that follows the abandonment becomes like a junkie's drug in reverse. Some poets thrive on pain. Some of our greatest creative geniuses have left us at such a young age knowing little recognition until after they had passed from this world. The heart is an elusive thing. 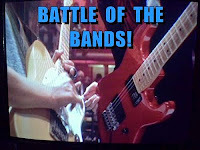 Battle of the Bands is the blogging event started by Far Away Series and now hosted by StMcC Presents Battle of the Bands. This event happens each month on the 15th and on some blogs there is also a Battle on the 1st of the month. My blog is one of those with a second Battle on the 1st of the month. The premise is simple: Listen to the songs presented below and then in the comments vote for your favorite and tell us why you liked it. Then visit the links listed near the bottom of this post for more Battle action. Often known as simply "The Song from the Moulin Rouge" the song performed in that movie which is lip-synced by Zsa Zsa Gabor while sung by obscure vocalist Muriel Smith should be more appropriately called "It's April Again". Some of of the more well known recordings are instrumental versions by orchestras such as that of Percy Faith. The song was originally a French song called "La Long de la Seine" making this a song that can be found under a few different names with many recordings of diverse stylistic forms and performing artists. The version known as "Where Is Your Heart" was very popular in the fifties and into the sixties. Jazz trumpeter Jonah Jones began his career in the 1920s playing on Mississippi riverboats. He had numerous recordings released with his ensembles from the 1950s up to his death at age 90 in ther year 2000. My father liked the singing of Joni James so much that my parents named one of my sisters after her. I never knew this until my mother told me a few years before she died. I don't remember ever seeing any of James' albums around our house and I only vaguely recall her name back when I was a kid. These are two very different versions with something to be said for either one. Do you have a preference between these two choices? Which version do you like the best? You don't have to know about music to have an opinion since it all comes down to your own personal taste. Please vote on your favorite by letting us know your choice in the comment section and tell us why you prefer the version you chose. Then after you've finished here, please visit the other blogs listed below who may or may not be participating this time around. 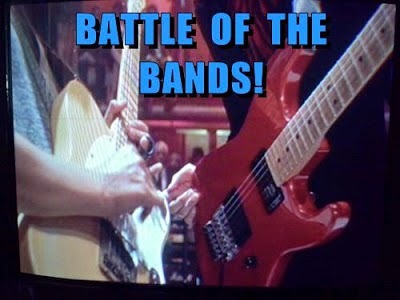 And if you've put up your own BOTB contest let us know that as well so we can vote on yours. Between now and results announcement day I'll be making my contribution to the Insecure Writer's Support Group on Wednesday December 6th. In the meantime, between now and next Friday, please don't forget to vote on this Battle. Come on, have a heart! Did you ever love someone who couldn't seem to return your love? Have you ever learned about another's love for you that you never realized was there? What is your idea of the ultimate romantic location real or imagined? Labels: Battle of the Bands, Jonah Jones, Joni James, Moulin Rouge, Where Is Your Heart? That's a close one. The versions are vastly different. I'd give the edge to Joni for her voice. Joni James, without a goubt! Pop Tart, looks like we're starting off with a trend. The second one is pretty. L. Diane, the second one it is. Yes, both are pretty, but I'm a sucker for brass! First one. H.R., all right! Shut out averted. Both great versions. The trumpet put a little pep in my step, so I'm casting my vote for Jonah Jones. Mary, I need some pep in my step. Joni had a lovely voice, it's true, but Jonah Jones brought this song to life. He gets my vote. John, and your vote is making this Battle a race! joni gets my vote. so tender. Susan, thank you for your vote! Michael, good call on the "Manamana" feel. I can hear it for sure. Not what I grew up with on this song but it's fun and well done. LEE, you got yourself a J.J. versus J.J. BOTB here. This one was a bit tough on me. To be honest, I listened to both recordings twice and didn't care for either of them the first time through. I liked the horns and other instrumentation in the first one but didn't care for the arrangement. The use of the background singers didn't appeal to me. Which is kind of odd because they reminded me of The Conniff Singers, whom I like. But somehow that didn't seem to belong in there. Joni James did not appeal to me at all. I felt it was just too slow and I didn't like the high-pitched quality of her voice. But I listened to both again a second time about 90 minutes later. And this time I liked the JONAH JONES version better than at first. I'm still not wild about the background singers inclusion, but knowing it would be there when I replayed the song, I was better able to accept it. The Joni James version I did not like any better the second time around. So please give my vote to JONAH. STMcC, I totally agree about that Ray Conniff singers sound which I like too. I liked how there was a strong similarity in the artists' names with a vastly contrasting sound between their versions. I think it made for a kinda cool Battle. Yeah, that was pretty neat. It was male vs. female; instrumental vs. vocal; uptempo vs. ballad. The ONLY thing similar were the names! I had to keep scrolling back up again to make sure I had the names straight. Ha! Lee, this takes me back some years, To me it have always been around. A lovely song and words. I liked the Joni James.The two versions are excellent but sightly more I like Joni. Yvonne, same for me. I used to hear this song so often on the radio and my parents had a few records by different artists doing this song. It's a beautiful wistful song. I recognize this song, but never knew the name of it or that it came from the Moulin Rouge movie. That's a revelation! The Jonah Jones version is a bit too "peppy" for my taste and IMO, doesn't really suit the song. Please give my vote to Joni Jones. Oops! I mean Joni James. Debbie, the names are kind of confusing aren't they--lots of variations on the letter "j". A vote for Joni James. I listened to both recordings and didn't care for either version. Joni (to me) has a reedy little voice that is unappealing, and Jonah's version is spoiled by the background singers. The song itself didn't do anything for me. Jonah did a whale of a job on the trumpet, but those background singers were hard to swallow. I read the previous comments and decided to regurgitate what McCarthy said: "the second time through they were easier to accept." Sheboyganboy, that's a pretty harsh assessment. Maybe you just don't like the song and that affects anything else about it. I could probably think of some songs that would affect me the same way. Just the other day I was thinking that someday I should do a Battle between songs I basically disliked. Could be interesting. A so-so vote for Jonah. Pat, they say dogs can have unconditional love and I think that is true. No fickleness there. It seems I'm in the minority here. I really enjoyed the first one. While Joni has a beautiful voice, there's something about the first one that I really enjoyed. Elsie, I haven't taken a count yet, but it's been seeming like a close race. I do recall hearing this song over the years. The covers are different styles that evoke different feelings. I like them both very much but I think I prefer the lyrical arrangement better. Joni's soft vocals make you feel that she's singing about love. I'm giving my vote to Joni Jones. Any other day, I might go with the uptempo jazzy version but Joni stole my heart. Of the three questions you asked only one I can respond to. I think a secluded cabin in the woods with a gorgeous cozy fireplace to nestle in front of at night is rather romantic. Thanks for visiting and voting in my round of BoTB. Have a good Sunday afternoon! Cathy, so true--you definitely came to a concurrence with how I feel about these two. They are very different presentations that evoke totally different feelings. I once lived in a cabin in the woods up in Townsend near the borderline with the Great Smokies. It was such a great place. I can't say it was romantic at the time since I was sharing the place with three other guys, but I could easily see the romantic potential. It was by far the most beautiful setting I ever lived in. Thank you for your vote for Joni. Dezmond, I'd say a nice version could be played that way. I'm not unconvinced that you didn't put this battle together just for the confusion of the names. Give my vote to Jonah James. I mean Joni Jones. All kidding aside, I loved that jazz version by Jonah Jones. And yes, I did have to double check to make sure I typed the right name. ABFTS, I'll admit that the similarity of names had a lot to do with using the Jonah Jones version. I'd already decided to use Joni's version but the name similarity as well as the contrast between the versions cinched Jonah's place in this Battle. A vote for jazz and Jonah. I liked the Joni James version best. The musical stylings were more to my personal taste. I'm not really into romantic stuff (tomboy that I am), and never really wanted a honeymoon if I marry either, but my idea of a romantic getaway would be something more off the beaten path, less cliché. I'd love to have a little trip to the Far North, with one of the open-roofed places to see the Northern Lights (when the weather is nice). The Northwestern Territories has some of the most beautiful landscapes in Canada, I've heard, and there are also many beautiful places to visit in Nunavut. Carrie-Anne, those places in the North sound nice, but when the weather is warmer. Not sure I'd want to deal with any really cold weather. Hearing both versions provoked within my own emotional world the feeling of two different songs. Jonah Jones does a happy go lucky, jazz rhythmic beat that made me want to get on the dance floor. It didn't make me think about love but about partying. Whereas Joni James's voice evoked a melancholy sadness. I felt the wondering, the questioning of where is your heart. I felt the yearning to know where the heart was in her voice. It was for me a plea. So, my vote goes to JONI. Pat, nice breakdown. The versions are indeed polar opposites that illustrate the way music can be interpreted by different artists.